Figure 1: A plot of brightness against colour for stars that were observed by the Gaia satellite. 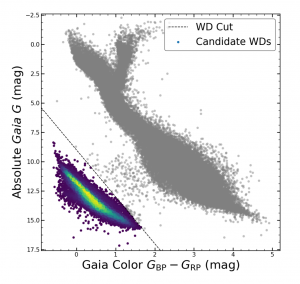 White dwarf candidates that were selected for today’s paper are shown by the coloured points. Source: Figure 1 in today’s paper. All of these types of activity cause a white dwarf’s apparent brightness to change. There have been numerous searches for this type of variability by observing these stars in optical light. However, white dwarfs are very blue objects and most are brightest when observed at ultraviolet wavelengths. The satellite GALEX observed in the ultraviolet for nine years, between 2003 and 2012. It observed patches of sky for about half an hour each, and over its lifetime looked at around 77% of the sky. In today’s paper, our authors have looked back through archival GALEX data to search for white dwarfs showing different kinds of variability. The team compiled a list of white dwarfs from various catalogues. The stars in their list are shown in Figure 1. Of these stars, over 23,000 had been observed by GALEX. To help them sort through this amount of data, they defined an algorithm to find the targets most likely to be variable. For this they considered four ‘metrics’ of variability. The first metric used a periodogram of the data — a method for testing whether data varies with a repeating pattern. The second compared the GALEX data in the near-ultraviolet and far-ultraviolet (wavelengths of 227nm and 153nm respectively), to see if both were varying with the same pattern. GALEX observed at both wavelengths simultaneously, so if the patterns were different, it suggests that the variability was instrumental, or random noise, rather than actually coming from the star. The third metric looked at the root-mean-square of the data, a simple measure of how much scatter there is in the data points. The fourth metric simply considered how good the quality of their GALEX data was for that star. Each star was given a score on each metric, and the scores were combined to select the most promising variable candidates. The team looked at the 10% highest-priority targets by eye to check whether the variability appeared genuine or spurious. Overall, the team found 63 variable white dwarfs. Of these, 14 were already known: 13 pulsators and one eclipsing binary. Of the newly discovered systems, 41 were pulsators and 8 were eclipsing binaries. Figure 2: Brightness against magnitude for the sample of white dwarfs. Those which were identified as variable are indicated by coloured numbers, where the colour corresponds to the type of variable. Pulsators are clumped in two regions of the diagram, corresponding to hydrogen and helium atmosphere white dwarfs. Eclipsing systems are all somewhat brighter than the average white dwarf, due to the presence of light from two stars. Source: Figure 2 in today’s paper. A Hertzsprung-Russell diagram (brightness against colour) shows that the pulsators cluster in two groups (see Figure 2). This was expected, and can be explained by considering what kind of material makes up the atmospheres of the white dwarfs. Most white dwarfs have hydrogen atmospheres, but some have atmospheres dominated by helium. The different properties of hydrogen and helium mean that these types of white dwarfs become unstable and pulsate at different temperature ranges, and hence at different places on the Hertzsprung-Russell diagram. The fact that the pulsators found by the team all lie where they are expected to in the Hertzsprung-Russell diagram is a promising sign that the results are valid. In Figure 3 you can see lightcurves of the newly-discovered eclipsing systems. Eclipsing systems like these can help constrain stellar properties — they give some of the most precise measurements we can get of stellar masses and radii. 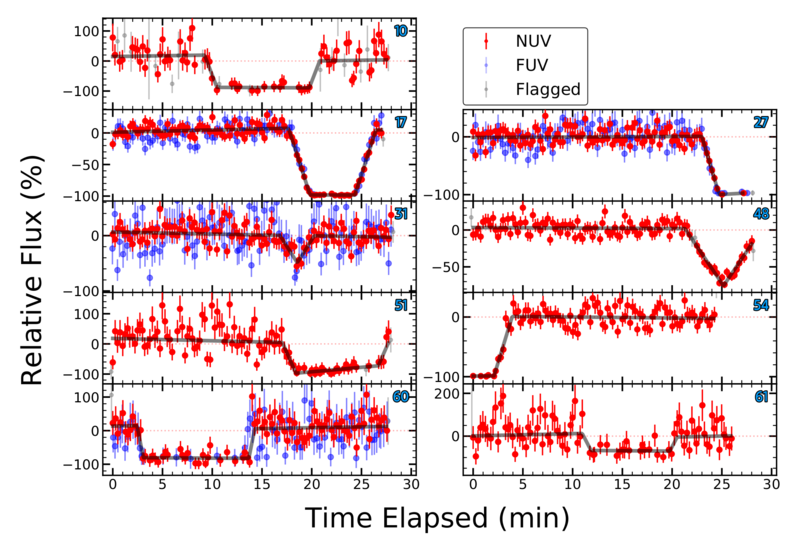 Figure 3: Brightness against time for nine eclipsing systems found in the GALEX search performed by today’s team. Of these, the first was already known to be eclipsing, and all others are newly discovered. Near-ultraviolet data are shown in red, far-ultraviolet are shown in blue. Source: Figure 4 in today’s paper. Lastly, the team comments that they have found no white dwarfs with transiting exoplanets. This is not surprising — we know that such systems are rare, because only one is known so far. Using their data, the team injected fake planetary transits and tried to estimate the probability that they would have seen such a system if it existed. They estimated an occurrence rate for such systems of at most 0.5%. This is perhaps lower than expected — previous estimates have been around 1 to 10%. The white dwarfs found in this paper are an excellent opportunity for future science. Each of these pulsators and eclipsing binaries can be followed up to provide us with quality measurements of the properties of these stars. Increasing the number of stars with good measurements gives us a larger sample of stars that we can do statistics with, which will help us understand the population as a whole. By looking into archives from the past, today’s paper is paving the way towards exciting future results. Progenitors of AM CVn systems Timing is Everything: A Pulsar in Orbit A Cepheid Pulsator in an Eccentric Binary A Contracting White Dwarf?